The Springdale Candy Company sells handmade chocolates, homemade and Farr s ice cream, unique sodas and a large selection of nostalgic, modern and international candies. The owners will be changing the name of the store to Zion Sweet Shop in late 2016. The penny machine is just inside the door to the left. Hours of operation: Vary, but typically open from 11:00 am to at least 6:00 pm (as late as 11:00 pm during the tourist season). 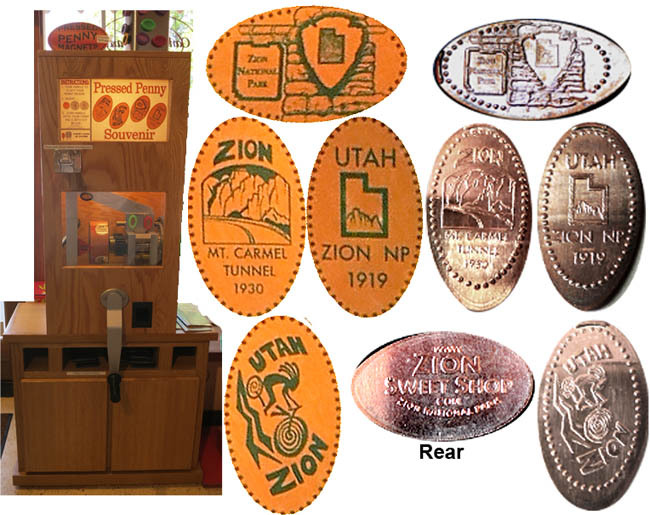 They also sell pennybandz for $4.99, a pennybook for $4.99, and the penny magnets (a pressed penny goes inside) for $2.99; all require sales tax. There are only a few parking spots in front of the store, but there are more around the corner past the laundromat, all are free. 1. (H) Relief of Zion National Park entry gate sign with National Park . 2. (V) Mt. Carmel tunnel with Mt. Carmel Tunnel 1930 . 3. (V) Utah state outline and Zion inside it with Utah Zion NP 1919 . 4. (H) Kokopelli riding a mountain bike with Utah . Reverse side: www. Zion Sweet Shop.com Zion National Park . thegillion added Springdale Candy Company / Zion Sweet Shop to system.